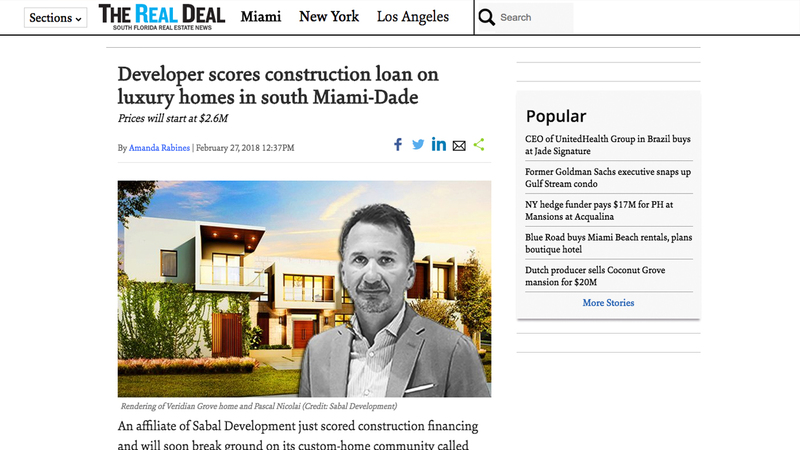 An affiliate of Sabal Development just scored construction financing and will soon break ground on its custom-home community called Veridian Grove in south Miami-Dade. The company, led by luxury home developer Pascal Nicolai, scored about $16.2 million in construction financing from Branch Banking and Trust Company, property records show. Nicolai bought the 10-acre property at 8290 Southwest 120 Street in 2015, but no price was recorded. The developer plans to build 20 luxury homes priced from $2.6 million, with lot sizes starting at 15,000 square feet, according to a press release.